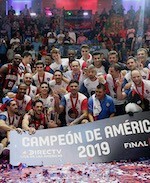 San Lorenzo gained a comfortable victory over Bucaneros in Buenos Aires. Gabriel Deck (199-F-95) stepped up with 23 points to pace the Argentinean side. San Lorenzo held their opponents to just 11 points in the first term to take a 9-point lead. San Lorenzo followed with a 38:19 run in the second half to seal the winning outcome. Marcos Mata (201-SF-86) and Jerome Meyinsse (207-C-88, college: Virginia, agency: Stealth Sport) scored 12 points each for the winners. Jordan Hamilton (201-G/F-90, college: Texas) responded with 19 points and 9 boards for Bucaneros. Hebraica topped Arecibo in the Liga Americas Group C opener. Leandro Garcia Morales (186-G-80, college: Texas A&M, agency: Pro Sports) scored 22 points to lead the winners. Hebraica grabbed a 25:13 lead after ten minutes. Arecibo picked up the tempo in the second term. The Puerto Rican side dropped 27 points to pull within a single point at halftime. But Hebraica went firing from all guns in the third term. They extended the lead at 16-point mark at the final intermission. Arecibo drained 26 points in the fourth term but could not avoid the loss. Michael Hicks (196-F-76, college: Texas A&M-CC) tossed in 17 points for the winners. Donte Greene (206-F-88, college: Syracuse) responded with 22 points and 7 boards for Capitanes.